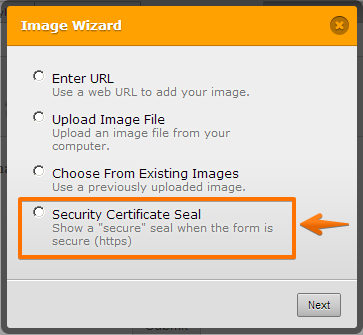 I'm not sure if you are referring to Security seal on the form to be enabled. If so, you may add it from the Image wizard. Please refer to the guide below that can help you with this. If you are referring to something else, please let us know. We will be happy to help! THanks! That was what I was looking for and I actually did find it. I accidentally hit the send button before completing my question! No problem. Glad to see that you have figured it out how to add the seal on your JotForm. Please do not hesitate to get in touch with us if you need any further assistance. We will be happy to help.